I just love free motion quilting though I still find myself holding my breath as I move my fabric! Breathe! Breathe! I try to practice and experiment with scraps a few times a week. I ALWAYS practice before launching into quilting on a new art quilt, my greatest fear is still that I will ruin the quilt. That fear can prevent me from trying new designs and “motions” so I work hard to overcome it. 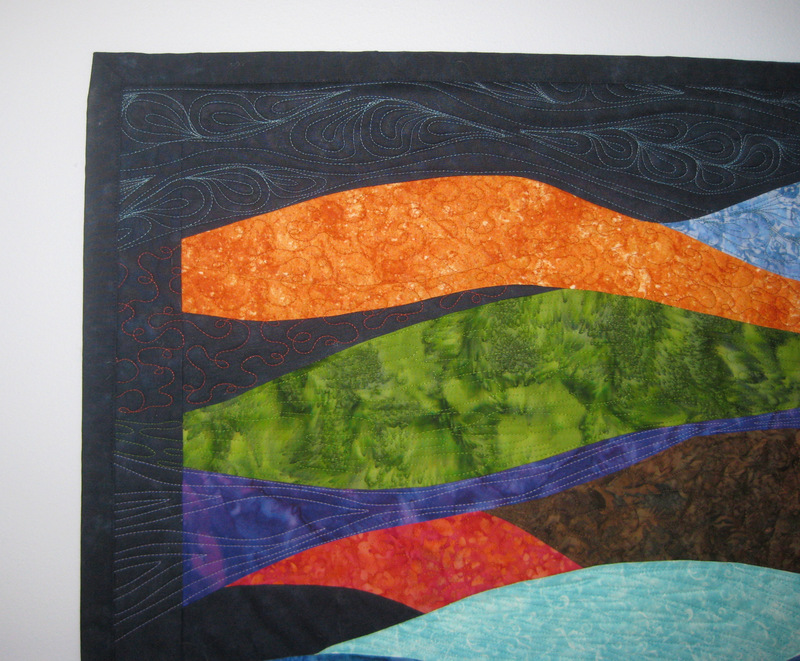 I’ve used the Free Motion Quilting Project website with over 400 designs many times to stimulate ideas and creativity. The tutorials are fantastic. I want to think of the sewing machine as a paint brush and the thread as paint, moving the fabric in free motions to create designs that accent patterns and colors in the quilt. I have a Bernina 750 which I purchased for many reasons but one of the main ones was the Brenina Stitch Regular foot or BSR. HOWEVER….and this is a big however, I’m finding that my BSR seems to spaz out on me on just about every project, making extra big stitches no matter how fast or slow I’m moving the fabric. It is as if it suddenly moved into slow motion. I’m actually on my second BSR since I bought my machine 18 months ago and I’ve been back in several times, with a quilt in hand to point out the stitch size problem. It always seem to work for the technicians who thankfully are only 3 miles away. A few months ago I pulled out the darning foot and did free motion quilting the old fashion way. I’m almost afraid to admit that I’m better with the darning foot! Is anyone else experiencing this? The Bernina 750 has a speed regulator so I can set the speed and not need to use the foot pedal which is hard to keep at a consistent speed. With the speed set, it is easy to get into a rhythm with free motion movements. I hope to hear from others about your experiences. Happy free motion quilting!